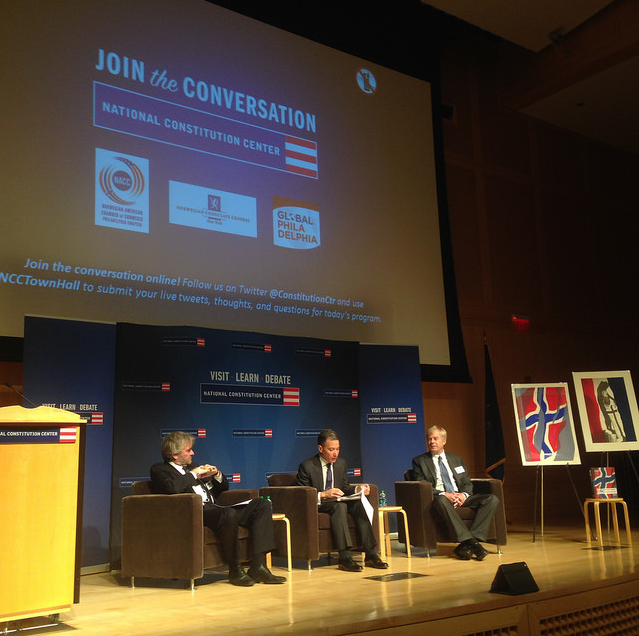 In celebration of the 200th anniversary of Norway’s Constitution, the National Constitution Center and the Norwegian-American Chamber of Commerce (Philadelphia Chapter) presented a conversation on the influence of the Founding Fathers and U.S. Constitution on the Norwegian Constitution. Participating in this discussion was University of Oslo Prof. Ola Mestad and University of California Prof. Kaare Strøm, while Jeffrey Rosen of the Constitution Center moderated. The discussion can be viewed here. The art exhibit is currently on view at The Constitution Center in Philadelphia. On view in the lobbies of the Annenberg Center and Kirby Auditorium, 1814-2014 Red, White, and Blue celebrates the 200th anniversary of the Norwegian constitution. Its creation was influenced by the democratic forces of its time, but most especially by the U.S. Constitution drafted in 1787. Today, they are the two oldest, written national constitutions in the world. Inspired by this history, a group of Norwegian artists have created the contemporary artwork displayed in this exhibition, exploring constitutional themes shared by Norway and the United States.